In our Drawings for Stories exchange last December I met Marion who has sent some descriptions of Lancasters traders and the market. Like many people she remembers a time when you could find all kinds of unusual and specialised things among the traders. When we came to Lancaster, we only went to independent traders, and I was pleased to see, for example, that Galbraith’s features in one of your pictures. Gorrills had two shops, and there were about four that sold nothing but birthday cards and Easter eggs. Postlethwaite’s, the baker, was also a favourite destination, in premises now occupied by Gregg’s. An important feature of the Covered Market before the fire was the fish market, but upstairs on the balcony was a treasure trove of interesting things, particularly several traders who sold old postcards (all of which got burnt), and even the kind of brush you use for sweeping crumbs off tables which, with its paper mache pan, I still have. On King Street there was a wonderful toy shop for some years, as well as one for jewellery and ceramics, both of them owned by people with links to the university. The Rocking Horse Shop, near to C. E. Barrow, was much loved by everyone. We still use as many as we can of such traders, including for meat, flowers and even our pharmacy. Lancaster is my home-town. I spent most of my teenage years (and most of my pocket money,) in the town’s independent record shops- notably ‘Ear ‘Ere & Hedgehog Records. By the 1980s ‘Ear ‘Ere was in Penny St, (but I think it started out as a market stall?) You needed faith & persistence to ensure that a record, ordered at ‘Ear ‘Ere, would materialise. Hedgehog Records was a second hand specialist in the market ‘though, for a brief, thrilling period, it had another branch on Brock st(?) A friend of mine was especially dismayed by the Market fire of 1984 because a staggeringly rare record, put by at Hedghog, was now melting behind the counter. (We could hear explosions way up the hill at the Grammar School on Dale St. ) Of course, since the advent of digital music, most record shops, independent or otherwise, have vanished. All those mysterious orders & fabulous rarities are a couple of clicks away on a laptop. Oh wasted youth. Amazingly, Lancaster Public Library is now a music scene focal point. http://www.getitloudinlibraries.com/content/about. Perhaps there’s a demented Muso inside of every librarian? It was absolutely phenomenal in the old market (before the fire) you couldn’t walk through the aisles and get past people, there wasn’t a supermarket. Lancaster itself, the town, was where all the food was; in the market and around about. It was so good to go to work there, it was really busy, people could by fresh all the time and you didn’t overbuy what you wanted. We have survived through the loyalty of customers buying local produce, its the quality of cheese that we sell. We sell Lancashire off the truckle and you don’t normally get that in a supermarket. The second in a series of posts recounting the things people have talked about during the project is about the old Lancaster covered Market Hall and the quotes and images in this post come from Ron Wood, the Marsh History Group and traders in Burgess Cheese, The Bacon Stall, Bebe Babette and D Gregory the butcher. There was a single floor victorian market hall that tragically burned down in 1984, a new market was built and opened almost 10 years later but it has been a controversial venture as its architecture is very different (on two floors, with steps up to most entrances and defined stalls rather then flat and open plan) and its new position takes it away from the natural flow and movement of people through town. Far fewer people pass through its doors than did in the old market, as someone said to me; If it was all on one floor and we were all together it would be a much better market. But despite this there is a great rapport between traders and customers, an a real sense of care about the produce traders sell. I always came home with a huge bag of market purchases from homemade ham, to local honey, Lancashire cheese to local kippers, and I wish I was much closer to use the market more often. The market has been threatened with closure to which many people have reacted strongly, participating in protests that raise the issues of how important a community, social and civic space the market is. People I spoke to remembered that because the old market hall was on ground level they often walked through the market on their way somewhere, something they would be unlikely to do now. 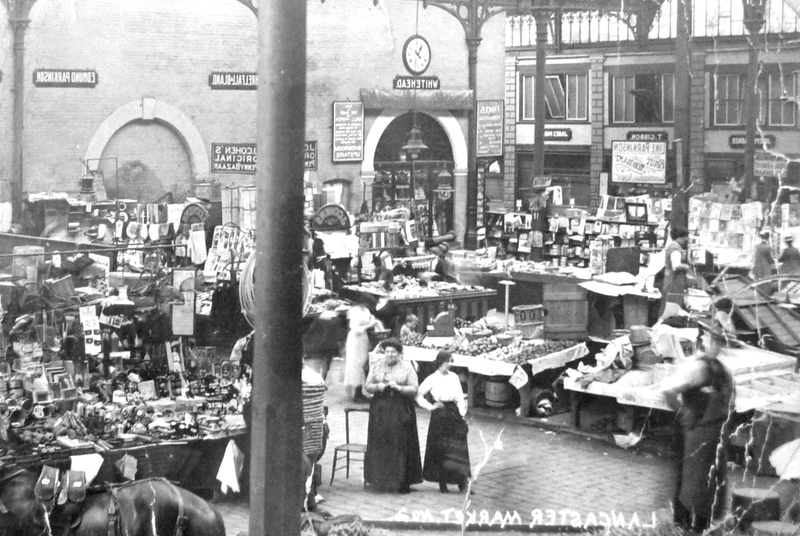 The market now faces financial difficulties that must be exacerbated both by the aftermath of the fire and by radical changes in shopping habits, however in many of my projects people have told me that it is the more informal, ‘human’ scale places like markets (rather then chains or superstores) that give them a sense of community. It seems also to be one of the places where people feel they can easily find out where their food has come from, and markets are often one of the places where food can be bought economically and with waste rather than in set packages – so if you only want one tomato, you need buy one tomato. The Markets are meeting places for people, so long may they reign – the big chains and supermarkets are making the high streets like ghost towns. A lot of the customers rely on us and without the market there would be a lot less character in the town. 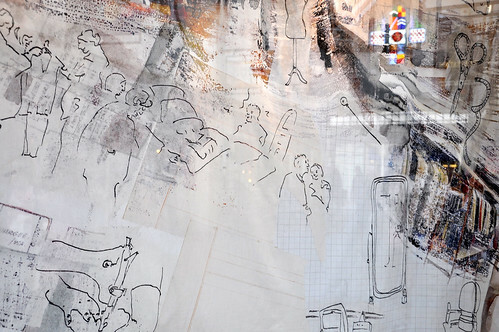 We’re delighted to say that from Thursday 24th February 2011 the As It Comes artwork will be up in St Nicholas Arcade, in the unit adjacent to Argos. 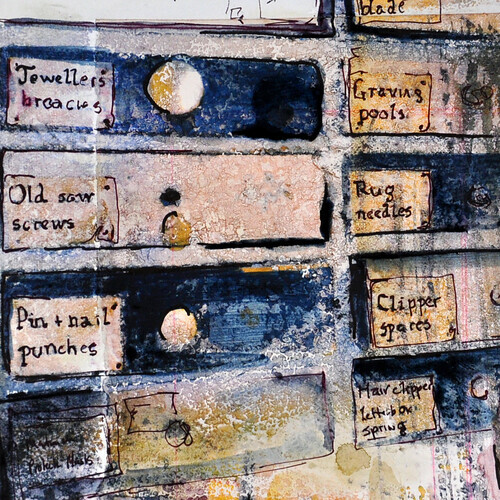 Drop by to take a look at it if you haven’t already seen Alice’s beautiful work, which depicts the trades and skills of Lancastrian independents and market traders. Trading in Lancaster has been centred around the local market for decades. Independent retailers coming together under one roof to supply the community with good quality, fresh produce. To discover more about this, one way is to speak directly with the stall owners themselves, asking questions including, is shopping in a market still popular? Is it easy to compete with large supermarkets? Where does all the produce come from? Do they have a secure customer base? If yes, how have they built it up? And finally, why do they do it?! The market place can sometimes be seen as the centre of a community. A place for people to meet, shop and trade. Lancaster’s historic market has changed considerably over the years but is still a place you can trust for fresh produce and friendly faces. 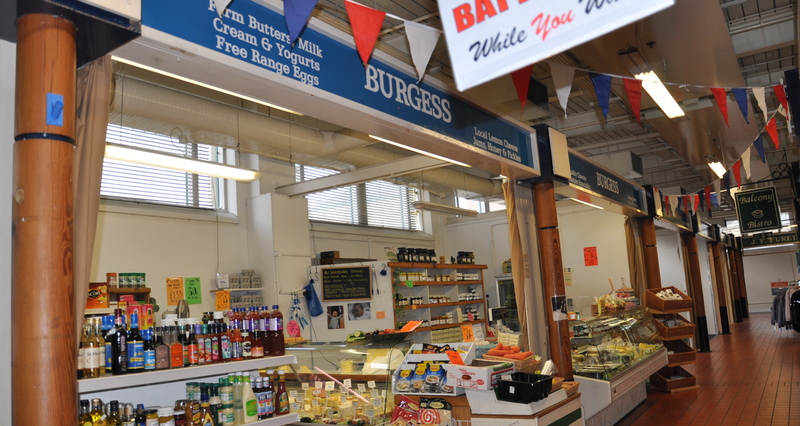 From fabric and jewellery to meat and fish, a range of locally sourced products can be found within the markets walls. Even though the market today isn’t in its original location due to a fire in 1984, tradition and continuity are still apparent in the way the stall owners trade and communicate with the customers. When speaking with many of the traders a dominant theme is apparent; customer service. Building up a rapport with the customer is very important to the traders in the market. A relationship of trust must be established so the customers will come back time and time again for good quality food. With the rise of more commercial food outlets and chain stores offering cheap deals on produce, traders in the market have pushed through with their customer service skills and in some areas have come out on top compared to major supermarkets. In the current economic climate supermarkets have had to lower their prices to keep their customers. Stall owners are continuing to provide good quality food and a warm welcome to customers to ensure their regulars don’t go elsewhere. Now more than ever people want to know where their food comes from, when it was caught/harvested and how long it’s been on the counter for. All these questions are easily answered by the traders in Lancaster’s market. When answering these questions the stall owners are helping to keep the importance of buying locally alive and stimulating the local economy. A study completed in June 1985 assessing the potential for increased intra-regional trading in the Lancaster area, stressed the importance for local buying, one resident of Lancaster stating ‘ we must do what we can to stimulate the local economy’. When speaking to the fishmonger (R&P Shaw) and butcher (The Bacon Stall) both stressed the important of their customer base and listening to what consumers want. Knowing what the customer wants before they know themselves is an important attribute a good trader must have. This enables the market to keep up with the demand and tailor their stalls to the consumer providing an overall more personal shopping experience. After the second fire in 1984 some market stalls were moved into a beautiful heritage building; The Assembly Rooms on King Street. Originally meant as a temporary residence for haberdashery and clothing, has now become a permanent site for vintage clothing, antiques and curiosities. Again these stall owners value their customer base and the importance of local trading. Each stall owner, like the butcher and fishmonger, have also built up a relationship with customers tailoring their products to their needs. Due to the intimate relationship between stall owner and customer they had been able to listen to what customers want and could keep up with demand. Even though big department stores and supermarkets have opened and become ever more popular in the last 20 years, local produce and customer service are still proving popular within the local community. Keeping local independent traders open in Lancaster is also important to the community and closure could be detrimental to the local shopping atmosphere and economy. So, with their passion for the job and traditional values, stall traders in the market and The Assembly Rooms should be praised for keeping the local economy alive and their excellent customer service skills. Without them, Lancaster could lack the charm and community atmosphere which distinguishes it from other major cities. When researching a topic on social history, one can only get so far with books, newspapers and photographs. It is the experiences of others that help to paint a picture of life in bygone times. Talking to older Lancaster residents tells us a great deal about shops and retailing in an earlier era of the city’s life. We can also learn a lot from written and photographic records, and from other sources such as contemporary newspaper adverts. The Lancaster City Museum provides the public with important bites of information about local history. This is the first port of call for anyone researching into Lancaster’s retailing past. The walls are crammed with information relating to a wide range of relevant topics, such as transport, housing, shops and pubs. More in-depth information can be found at the Lancaster community history library, which should be the next stop on the historian’s journey. Books, photographs, adverts, bills and newspapers can all be found there. These provide a more personal account of Lancaster’s trading history. The photographs illustrate the changing shop fronts in Lancaster’s town centre, while the adverts and bills tell us which items were popular to sell and buy. From these we can start to discover what Lancaster was like years ago; this gives us a better understanding of the daily lives of shop keepers. Photographs also tell us how Lancaster has changed from a thriving market town to a more commercial centre including chains such as Sainsburys and BHS. These sources combine effectively with the residents’ personal experiences to give a comprehensive picture of life in an earlier era. The St Thomas More Centre hosts a local history group and it is at these meetings where history comes to life through members’ stories and shared experiences. 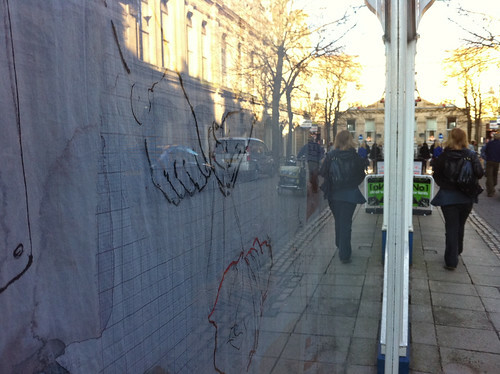 Goad maps laid out on the tables are there to provoke conversation between the participants, but it is the adverts from local shop windows which create the greatest response. Memories are sparked by vintage adverts and discussion leads to the layout of Lancaster town centre and the shops which have since closed down. Tripe shops, clog shops and hardware stores were common in Lancaster town centre. There were no supermarket chains and everything was tailored to one’s personal needs. Everyone knew everyone else, where they shopped and what they wanted. The shopkeeper’s relationship with the customer went beyond that of vendor and purchaser. The shop keeper was likely to be a friend, neighbour or even a family member. The sense of community Lancaster used to have is a hot topic among the history group. The shopkeeper treated the customer with respect rather than just seeing him as a source of revenue. One member of the group referred to a major shopping chain as a ‘conveyor belt of customers’. The group also commented on how we now live in a throwaway society- consider the excessive amount of packaging which comes with anything you buy. All products are now standardised and no longer come with any kind of personal touch as they used to. Each supermarket has its own range but underneath all the packaging, it’s all the same. In earlier times much less food was thrown away than is the case today. What we would now regard as scraps were kept and reused to provide further meals. One older resident said ‘we used to ask the butcher for a bone for the dog. Everyone knew we didn’t have a dog, we just needed something to eat’. The end of market day was also a time to gather food for a meal. Local traders would give scraps to children from poor families rather than just discarding them. Whywas so little thrown away in earlier times? Because people couldn’t afford to discard potentially usable items of food. What does all this add up to? So far as retailing is concerned, the past really is ‘another country’. They did things differently there. Was it better in earlier times? The residents we spoke to thought it was, many no longer shop in Lancaster but go further a field.